I’ve just watched a short film which shocked me. Basically the movie captured the knifing by one human being of another. Shocking enough to see real footage of the live cutting of a human, but the knifor actually got the knifee in the eye. I watched the youtube to prepare myself. Next week I will be the knifee. I’ve selected my knifor, a charming young woman who talks with me about books. If someone is going to poke a knife in your eye you might as well choose a good conversationalist. Because, they tell me, I’ll remain awake throughout the procedure in which she’ll remove my cataract. Yes, but what about anaesthesia? Don’t worry about that, said the doctor, we’ll use xylocaine jelly. But I do worry about that. Put me out, please. Don’t be a baby, said the doctor. So I remained awake. Someone removed my undies. Dumpy middle-aged women wearing scrubs didn’t bother to glance, let alone admire, while the man, an awardee of the Order of Australia, travelled north through a passage that had known southbound traffic only. Electrifying. I’ve been re-reading Philip Roth’s ‘American Pastoral’ in preparation for next week’s book chat. Next week, if I see my way clear, I’ll let you know how I go. Meanwhile if you enjoy a good vomit, google Cataract Surgery for the Layman you tube. Before I answered the calI I’d never heard of Trundle. When I googled it I might have giggled. A town of six hundred souls, Trundle boasts the second-widest main street in New South Wales, and its pub boasts the longest verandah in the state. I didn’t giggle. I held my mirth. All morning I chased my tail in the big city, I caught my plane, I recited the Traveller’s Prayer and I breathed out. It was dark when the plane dropped me at Dubbo. The bloke in the burger shop near the airport added up my bill for one bottle of iced coffee, one bottle of putative lemon. I pulled out a ten-dollar note. Something was different: the man didn’t scan the bottles. He did his calculation in his head. Ten dollars fifty, he said. The man looked up and saw my money. Ten bucks, he said. I thanked him. You’ll know where to come next time, he said. I said I will. I meant it. I took the shorter route to from Dubbo to Trundle. I didn’t realise the shorter route would take me by dirt roads for much of the distance. Over the two hours on those back roads I startled a few kangaroos but encountered no vehicle passing in either direction. The dark of Dubbo was darker out there in the quietness and the road signs were unlit. I took a wrong turning and got lost. I got unlost and entered Trundle. The wide main street was brightly lit. Nothing moved. At the hospital I asked the nurse, can you direct me to my quarters? No, she said, I’ll take you. Follow me. She jumped into her car, I into mine and we drove through the dark to a house that wasn’t brick. We bought this to let to visitors, she said. We’ve spent seven years renovating it. The nurse opened the front door and I stepped into the perfumed past. Motel deodorant swamped all olfaction. The nurse pulled a switch revealing animals that greeted me from every side. A steel sheep and a steel cow stood at either side of the front door. In the lobby a crocheted mouse in a lilac dress stood knee-high by a bedroom door. A second mouse in white stood guard at the second bedroom. A third mouse in soft pink waited by the third bedroom. Ladies’ hats hanged from hooks, trailing ribbons of many hues. A large painting of Trundle’s main thoroughfare (famed for its width) stood on the loungeroom floor. The streetscape peeped brilliantly from behind a swath of brown paper upon which someone had written, apologetically, Sorry, Not For Sale. Flowers fashioned of bright fabrics overflowed from waterless vases in every room. In the kitchen, mugs of colourful ceramic spilled from every cupboard. Relentless decoration everywhere. Art deco china cabinet, four kinds of chilli sauce and very white bread indeed. Décor surrounded me, pressing in from every side. Furnishings that dated backwards in time from the year 1950 overflowed in every room. Here was the Australian rural past in glowing abundance. Tucked behind a bedroom door, in the depths of a very large leather hatbox, sat a felt hat in sky blue. An emphatic navy ribbon decorated the hat. Above all stood a framed text, written in smart neo-gothic. Its title read, The Story Of a Hat. The story told how that hat was made by hand for a wedding at a period when no woman went to church unhatted or ungloved. It was a matter of respect. The story, unsigned, ended with the words, This hatbox belonged to my grandfather. Two thoughts registered: This house was, not renovated but de-novated – a home to memory. You would not sneer at sincerity. And kitsch would not be the word; this was love. In the main street shopfronts stood beneath brave signage. Two of every three shops were closed. A sign read, Trundle Talkies. Excited, I raced across the road to check the movie times. I was too late by thirty years. I read the signage above the garage. Pontiac, Plymouth – those makes that ferried my family across the state in the 1950’s – now extinct. A card in one shop window read, closed until further notice, ill child. I saw five clothing shops. The stock seemed to be the same in all five. Three were closed, one with a notice advising, Yvonne comes Thursdays and Mondays, 11.00 to 3.00. I went to the first of the open shops to buy undies. The child in charge was sorry, they had none. I might try the Op Shop two doors down. No undies there either, but I noted the stock in the Op Shop looked the same as in its competitors. Two doors down was the office of the Annual Abba Festival. Thousands attend. They put on a special train from Sydney. Everyone dresses up as one Abba person or another. Great are the festivities. I doctored in Trumble for three days. Most patients were farmers, heirs to farms worked by their families for generations. Many of these people were older than I. None complained when an emergency elsewhere in the hospital detained me. If I said, sorry to keep you waiting, they looked mystified, then assured me it didn’t matter. I thought about this. These people worked the farm from sunup to sundown. There was always work to do. But they had time to spare for other people. They’d survived the long cycles of dearth and plenty. In the present dry – the worst in memory – people were feeding their stock by hand. They’d stopped planting crops, waiting for the rains. They knew time differently from my patients in the centre of the great city. My principal in the practice spoke of an epidemic of depression, of farmers dying of sadness. Others would be forced from the land, to walk away from the family farm. 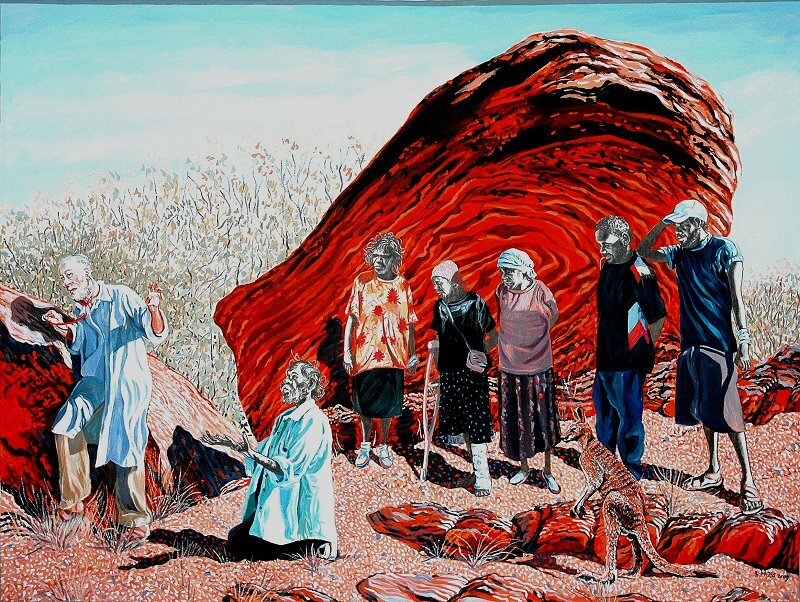 It occurred to me to ask, where are the Aboriginal people? Not here. We’re not on a river. And there’s no community in Parkes either – no river there. But strong communities in Dubbo and Forbes. They’re on rivers. My three days completed I rose at 2.45 am to drive to Dubbo to catch the earliest flight to the city. I drove down that wide, wide street, built for the bullock trains to do their long u-turn. I hurried through the dark, eyes wide for suicidal kangaroos. I arrived at the airport and checked in. I checked my phone: I’d arrived on time. Chasing my tail again. Just `on spec’, addressed as follows, `Goldie, Doctor of The Overflown’. For the bush doctor’s life has pleasures that the townsfolk never know. And at night the wond’rous glory of the everlasting stars. Comes fitfully and faintly through the ceaseless tramp of feet. For townsfolk have no time to grow, they have no time to waste. But I doubt he’d suit the office, Goldie, ‘Doctor of The Overflown’. So I obeyed. Paul read my book and enjoyed becoming acquainted with my father, a man like Paul, of unwavering principle. A correspondence followed. Seven emails a day informed me of Paul’s take on the news. He disapproved of Obama, and of his successor as President; much of Islam (as portrayed in the popular press) offended him as did illegal immigrants. He disapproved of gun control measures (‘if you take weapons away from the good people, we’ll be defenceless against the bad people’). He had a close relationship with God and the Republican cause. He loved humanity broadly. He loved his family with a proud particularity, and he nurtured tenderly the numerous stray cats and partially tame birds who adopted him. My email feed from Phoenix Arizona included Paul’s never-dull reports on the weather – its extremity and its beauty – on mushroom toxicology, on rattlesnake behaviour and on the conduct of those human snakes who conducted relentless scamming campaigns aimed to impoverish him. He loathed millionaire TV evangelists. He warned Israel’s enemies that ‘Jews will not go quietly to the showers again’. He warned the dictator of North Korea of the obliteration of his country if he started military adventures against the USA. Paul loved his country and he suffered the fiercest extremes of spiritual agony when faced with the horrifying (to him) electoral choice between Clinton and her opponent. While many found that choice troubling, it distressed Paul, so seriously did he take his duties as a citizen. In due course I met Paul in the flesh, enjoying his company in the house of his daughter Ann. Ann drove us to the sequoia redwoods nearby her California home, where she took a photo of those ancient trees towering over her ancient father, who in turn towered over me. On a later trip I visited Paul in his Phoenix home where we sat on the porch enjoying the desert sun and where Paul smoked his constitutional cigar. I promised myself I’d visit again in February 2019 when Paul would turn one hundred. This is John Jarrett, Paul’s youngest son. On Sunday, November 7th while Paul was getting ready to attend church, he suffered a pretty severe TIA, transient ischemic attack, which has put him under the weather. He has been having some difficulties in his daily routine so we have all been with him 24/7 until he recuperates. Thanks for your thoughts and prayers and I know he’ll be back on the computer as soon as he can. He loves emails, so keep them coming! I wrote to John, with my hopes and prayers for his Dad’s health. He had one “spell” (as my sister call’s it) about 3 weeks ago when she was visiting that took 3 or 4 days to show improvement after being 99% speechless for several hours. About 1 year ago, he was unable to speak while doing business at the banking teller window… He was getting Christmas gift envelopes for his children and grandchildren. He tried to type emails Sunday evening but was unable to make is fingers hit the proper keys… The speech problem impacts his typing too it seems… He hears with difficulty (as has been his hearing deficiency for years now) but understands all that he is able to capture in terms of sounds. Fifteen days have passed since Paul’s son wrote. Fifteen days of email silence. In the silence I picture Paul suddenly, taken suddenly mute at the bank teller’s window, as he tries to buy gift envelopes for his children and grandchildren. After I started posting some thoughts arising from the current euthanasia debates, four women whom I hold in esteem wrote in strong response. Two wrote openly on the blog, two privately. I will refer to them respectively as B, M, G, H.
I’ve just read your maybe not rousing speech but impassioned piece on euthanasia. If I should be dying and I should be in unbearable pain, and if through that pain I was not able to continue to relate to my loved ones other than to be overwhelmed by my pain, you would be one of the doctors I would reach out to to put an end to my pain and possibly my life. I suspect love would defeat principle or conviction or predisposition to life. In other words I do not know myself in abstractions but in my instinct and my sentiments. My ancient affection for you, my strong drive to help – which surfaced in your case in c. 1971 are as likely to govern me as any personal ‘rule’ or law. I am sure if someone came and demanded I act in any given way my instinct would be to resist. I anticipated readers would respond with passion and with pain to my piece. You asked would I help you. I know I would try. I cannot predict what shape my help might take. This is a heavy matter. No light answers. And for me, no right answers. From feeling like I was falling into a chasm your response came as a hand that reached out to stop me hurtling to my death. Strange metaphor given I was talking about asking you to help me to die. I am much relieved that love will play a big part in your decision making process, over and above noble and fine principles. But the debate hypothetically may be akin to Solomon’s choice. Would you be comfortable referring one of your patients who met the criteria to hasten their end to another GP who you knew would agree to assist in that wish? And if that patient asked you to be present during the event would you? How much do you think religion affects your current view? Or are you unable to separate your religious self from your professional self? I’m pretty sure my religious self is absent from this. It’s as if something deeper and defining is at play. I imagine that ‘something’ is what brought me into Medicine. But on the other hand, it was religion that framed my earliest thoughts. It is on reviewing the texts that I regret not telling F at the outset: I can’t imagine doing anything I will find comfortable. The best I can hope for is to be comforting. I find people’s responses to this topic rather fascinating (and at times irritating). So many reactions are full of judgement and criticism when it’s a topic that requires the opposite – compassion, objectivity and an acknowledgement of all of the grey. It would appear that a single (subjective) experience of dying makes some people self-appointed experts on the topic. I am of the thought that there is no ‘truth’ in any one person’s experience. And I wonder if those who react so emotionally to the idea of not having the ‘right’ to hasten their own demise have been more traumatised/suffered by the dying of another than the person who was actually dying? What do I know? I do know that I would prefer not to die of bowel cancer. My experience working on GI wards is that that would be a shithouse (excuse the pun) way to go. I know that until I am dying of a known cause I won’t know if I want the option to hasten my demise or not. I know that having witnessed many people dying of a known cause (some in pain, some in discomfort, some in fear) that I’m still not convinced that assisted death is the answer. But I’m not convinced that palliative care is the answer either – theoretically it should be but I doubt it will ever be financially. I know that those who have reached the palliative stage of their illness should never be admitted to an acute care ward in a hospital – I’ve witnessed far too many cases of what I can only term the neglect of those in their final days/weeks in acute care wards. And the reluctance of acute care nursing and medical staff to adequately manage final stage symptoms. I want to believe in palliative care but I’ve been waiting too long for results. I know that if you were my GP and I had a terminal diagnosis, I would feel like I had the best GP in the world. I would know that when you asked a question you would be genuinely interested in the answer. And I would believe that you would have a moment of quiet grief when I left this world. And that would be a comfort. As a nurse I never felt any sorrow for an anticipated death of a patient – the overwhelming emotion I felt was relief. Relief that there would be no more pain, no more nausea, no more confusion, no more discomfort from lying day after day in bed waiting to be turned brusquely. But I have a feeling that you experience a moment of sorrow for each death – correct me if I’m wrong. If I were your patient and I asked you to help me die and you indicated that you couldn’t then I believe I would want your help to find a doctor who would be willing. I would appreciate that you would feel obligated to offer alternatives but if my mind was made up and it was legal then I would want you to support my decision. You might not support assisted dying on moral and ethical grounds but having come reached a fully informed decision I would want your compassion to make that referral to a colleague who you trusted and respected. And the promise that if I changed my mind you would do everything in your power to make my end days as comfortable as possible. These words come straight from the bedside. They come from one who has stood with me at the bedside. I cannot gainsay a word of them. Yes I do sorrow for every death. Yes I sorrow for every pregnancy loss. I grieve inwardly for a miscarriage. There is something universal here and something personal. The universal is the instinct that drives all of us to struggle for life. The personal is hard for me to define or even to describe. It comes into focus most sharply for me at the birth of a child. Those moments find their mirror image in a death. The one elates me, the other deflates. I’m sorry you feel you could not give this final relief. I am a convert to assisted dying (this is not euthanasia – which implies someone else’s decision that you should die). My feeling has always been that adults who are dying should have some choice about their death, and seeing three dear relatives all the way to death, I am now utterly convinced that such choice should be available. I understand that in states in America where such choice is available, of those who take up the option only a small proportion use the drugs supplied. But, those who receive the drugs and do not use them, are much calmer and happier, for knowing that they have control and can die should they feel they have had enough. H here echoes an experience described to me elsewhere by B, arising from her work with men diagnosed in the 1980’s with HIV-AIDS. At that time the diagnosis was a death sentence. Some of the doomed acquired the means of ending their lives painlessly, with the intention of using it at a time of their later choosing. Of those men only one availed himself of the drugs. The others lived out their natural term. Knowing they were able to die enabled them to live on. Very thoughtful. And probably helpful to those who didn’t like your last post. I have put the link up on my FB page. M often comments favourably on my blog. When she doesn’t approve she’ll keep her disapproval away from the public eye. M is of course (as she signs herself) my loving sister.